Last One in is a zombie themed game with a difference, it’s competitive! There are also two very different ways to win making this something very different from the standard zombie game. Any additional stretch goals that may be reached during the campaign! Start by separating the building cards from the rest of the deck. Shuffle these up and deal out two to each player. Shuffle the rest of the cards (the town cards) and deal three to each player. Place the decks at opposite sides of the table. Draw five cards from the town deck and place them face up in the middle. Each players turn consists of six phases, some of these are compulsory and there will be times you will be unable to do some of them. Play a building card. 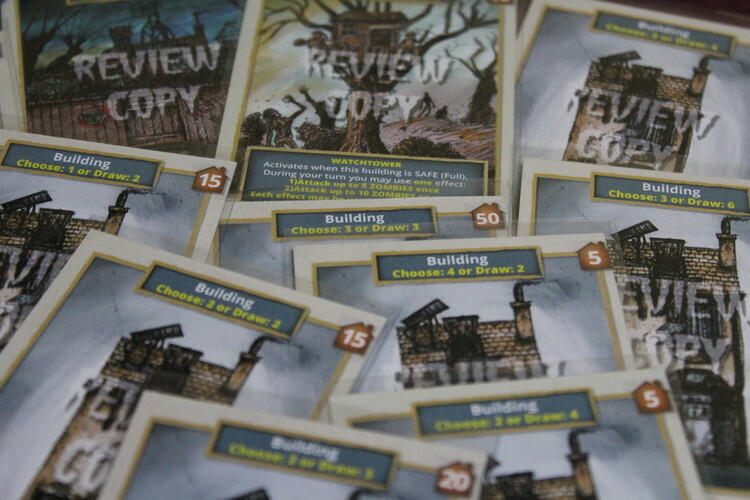 This then becomes your open building where you will place civilians and will also determine how many cards you can draw. Choose or draw cards. At the top of your building will be an option to either choose cards from the face up ones or draw blind from the top of the deck. If you have not played a new building this turn and do not currently have an open building, you may draw a card from the building deck. Rescue civilians. Play one civilian card from your hand onto your open building. Attack with zombies. Put a zombie card from your hand into your opponents zombie pile. Play a neutralisation card. Neutralisation cards can be used in one of two ways. Use the defender half to neutralise zombies currently in your zombie pile or use the lurker half to force your opponent to lose civilians they have in an open building. End of turn, if needed discard down to six cards in your hand. You cannot discard buildings Civilians and zombies you discard go straight to your zombie pile. The game ends when one player has fifty civilians in safe houses or if one player has one hundred zombies in their zombie pile. There are five different card types in Last One in, all with their own function. Within each type there are some special cards with extra abilities, so make sure to read each card text when you draw them! 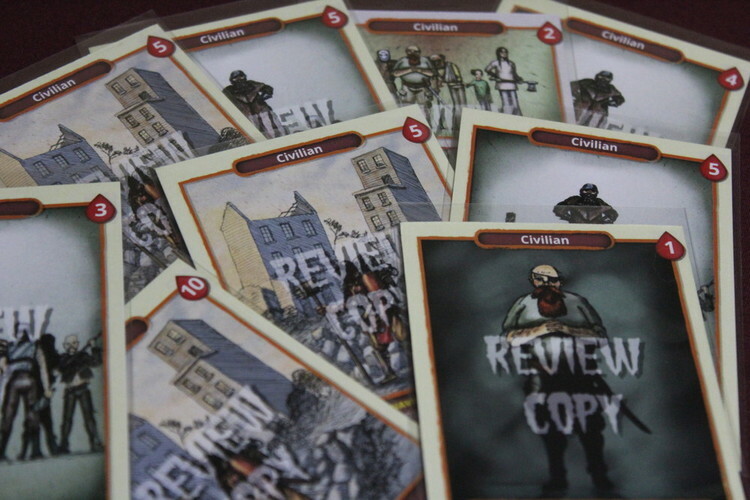 Building cards - These have a capacity value on the top right of the card that tells you how many civilians it can hold. When you reach exactly that number the building (and civilians in it) is considered safe. There will also be a ‘choose or draw’ effect at the top of the card. Your open building determines how many cards you can draw that round. Civilian cards - The number on the top right tells you how many civilians this card represents. There are quite a few civilian cards that have special abilities, so remember to check for these! 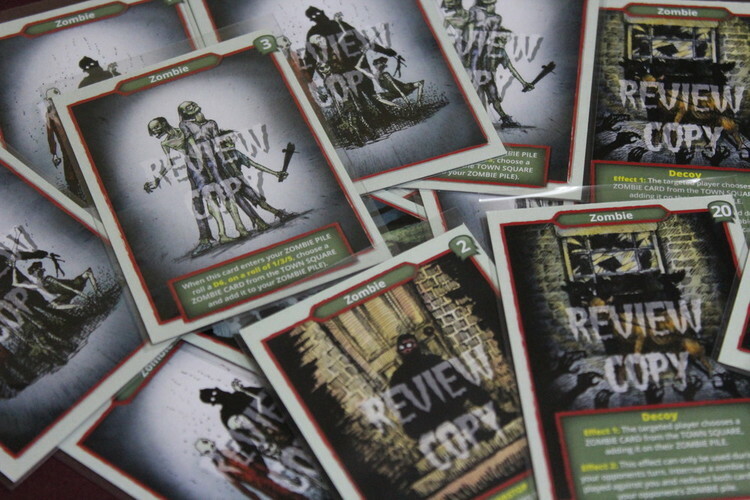 Zombie cards - The number on the top right tells you how many zombies this card represents. Some of these cards have effects that trigger when they enter the card row, some when they are played and some can even be used as a response to attacks. Civilian/Zombie cards - These are dual purpose cards that can be used as either type, depending on what you need at the time. Once they come into play as one type they stay as that type for the rest of the game. Neutralisation cards - Again, these are a dual purpose card that can be used in multiple ways. 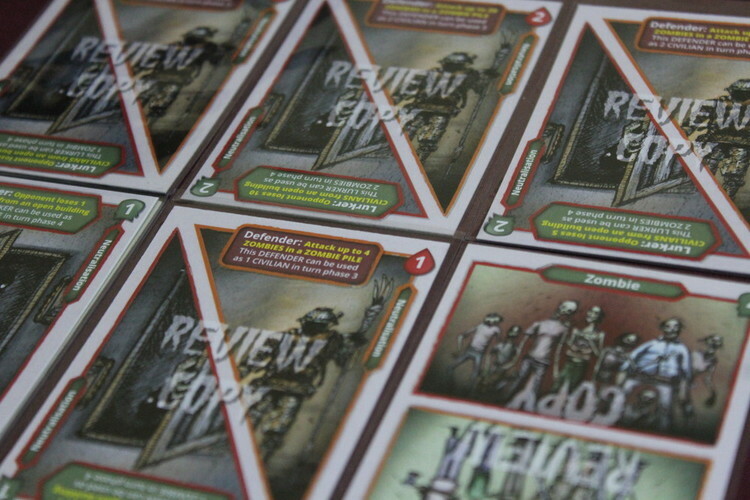 The ‘Defender’ half of the card can be used to remove zombies from your zombie pile or used as a civilian card. The ‘Lurker’ half can be used on an opponent's open building to force them to lose civilians or else can be used as a zombie card. Although primarily designed as a two player game, Last One in works well as a three or four player competitive game (with slight tweaks from the rulebook) or as a four-player 2 vs 2 game. Let’s face it, the zombie genre has been done to death. However, Last One In offers something original. The multiple ways to win something different and the card synergy is, at all times, elegant. With beautifully detailed artwork from Aaron Howdle, this is a KickStarter to watch out for! 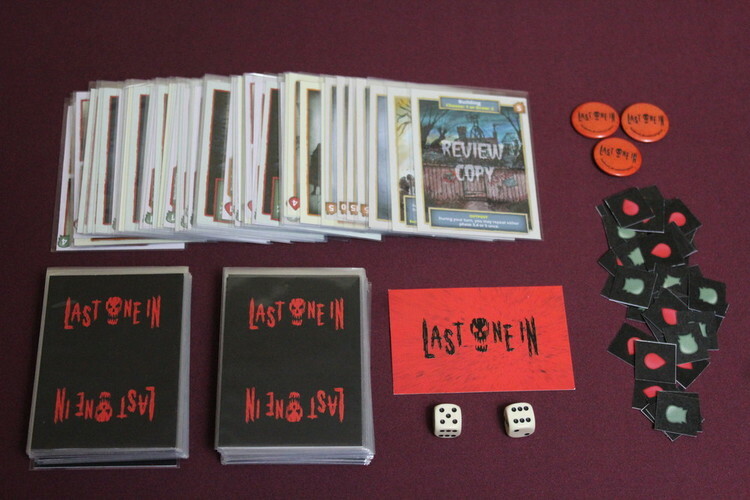 Launching at the end of the month, Last One In will also be available to demo at UK Games Expo 31st May - 3rd June.